The acquisition of Micromuse® Inc. brings new opportunities for all involved in IBM® Systems Management discipline, and the development of a new and exciting strategy. This IBM Redbooks® publication should be used when planning and implementing an integration and upgrade strategy from TEC to OMNIbus. In this book we provide recommended best practices and describe strategies for upgrading existing installations in a way that should best suit the needs of existing TEC-based environments. The audience for this book is anyone involved in the Systems Management discipline, but it applies primarily to both those with a Tivoli or Netcool background, and is aimed at customers with an existing Tivoli Enterprise Console® investment who are looking to evaluate the comparative characteristics of TEC and Netcool/OMNIbus™ , so that they can perform a system upgrade. Depending on the complexity of the existing environment and the depth of the requirements, this upgrade could be a significant project, but we aim with this book to make it as straightforward and as successful as possible. We have structured the book to first introduce a quick overview of the products, highlighting the key benefits of Netcool/OMNIbus so that both audiences can become familiar with the different concepts. Then the architectures of both products are discussed in more detail, concluding with some typical scenarios. Part 2, "Strategies” on page101, reviews planning and strategy. It begins with detailed guidelines on assessing the existing customer environment in order to identify how TEC is currently deployed. We discuss considerations to make and how to plan the activities required to upgrade. Then different upgrade scenarios are presented with a best practice recommendation that the reader can adapt to his environment. 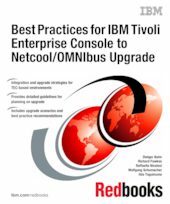 At this point we would like to stress that this book builds on the utilities provided by the Tivoli and Netcool Integration Event Flow package (downloadable from the IBM OPAL Web site), and the recommendations from the Tivoli & Netcool Event Flow Integration white paper. The main distinction is that they cover various event integration scenarios, whereas we, in addition, map out a complete upgrade path to OMNIbus in our recommended strategy. The implementation of the suggested strategy is then covered in Chapter 2, "Configuring the event sources” on page277. We describe in detail the steps required to achieve the upgrade with the core components, and discuss other tasks to also keep in mind. A wide range of different rule processing examples are provided, giving comparative and practical guidance, providing a valuable asset for the rule programmer. Finally, additional technical details on configurations and scripts used and other valuable references can be found in Appendix 2, "Lab configuration” on page367.